Howard Milstein’s implementation of this mission predated the establishment of the National September 11 Memorial & Museum and began on the day the Twin Towers fell. Following the attacks on the World Trade Center, the Milstein Properties buildings in Battery Park City provided rest areas and food for first responders. An undeveloped piece of land was used as a staging area for Verizon to restore its damaged phone lines and cell phone repeaters. Mr. Milstein donated hundreds of rooms at the Milford Plaza Hotel, which was a major gathering point for donated supplies that were delivered to the World Trade Center site. He also provided linens, towels, cleaning solvents, mops and brooms and released several executives for three months to assist and respond to requests for equipment and supplies. Finally, the Milsteins donated funds to ensure that each of the 3,000 victims’ families received a piece of World Trade Center steel that was part of a memorial sculpture by Brian Hunt. That sculpture is part of the permanent collection of the memorial. In 2002, Howard Milstein, as one of the major developers in the area near Ground Zero, was appointed by Governor George Pataki to the Lower Manhattan Development Corporation to assist in its post-9/11 revitalization. He was subsequently appointed to the Board of the National September 11 Memorial & Museum. 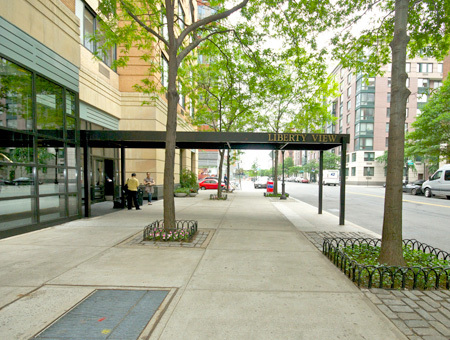 Liberty View, one of the Milstein Properties buildings in Lower Manhattan, that provided rest areas and food for first responders following the 9-11 attacks on the World Trade Center.